We provide a comprehensive personal approach to your financial planning to ensure that we are on track with your positive results that help bring your retirement dreams to life. Our financial planning team provides you with strategies for financial, estate, business succession, tax and philanthropic planning, along with a range of wealth management consulting services. Wealth planning is more than just planning how to manage your finances and budgets. It is about creating a continual flow of income to fund your lifelong dreams. This is what we call having a Sound Approach to Financial Planning. 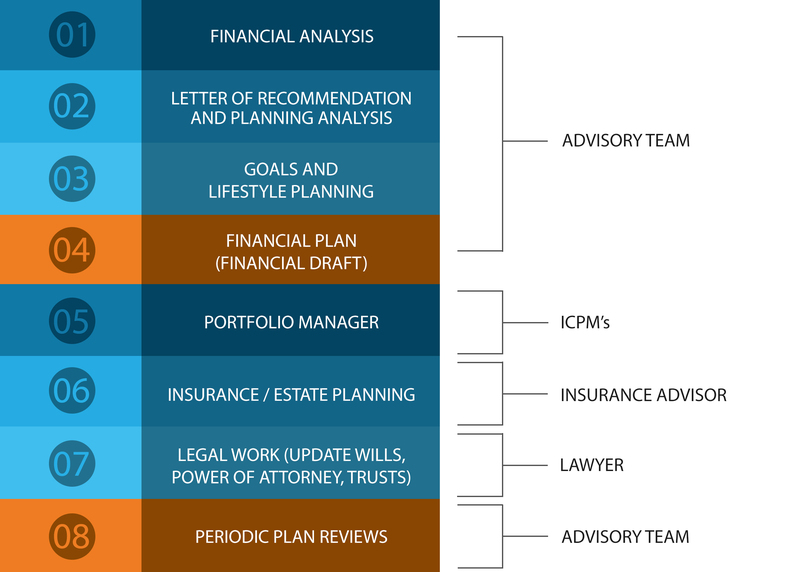 The 8 Step Wealth Management Process takes a comprehensive approach to financial planning. Through a written customized wealth management plan, our team addresses all areas of your finances, including tax minimization planning & estate planning, retirement income planning, philanthropy, and business success. The process will take you through a number of meetings, followed by a meeting with a tax lawyer. Once the plan has been implemented, a structured review program is put in place that includes regular financial planning reviews to help ensure you always remain on track for your goals.